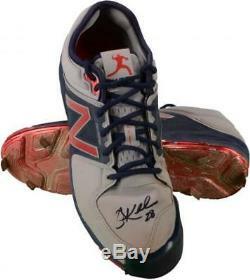 Corey Kluber Cleveland Indians Autographed 2017 Spring Training Used Gray and Navy Cleats with 2017 Spring Training Used Inscription - Fanatics Authentic Certified. 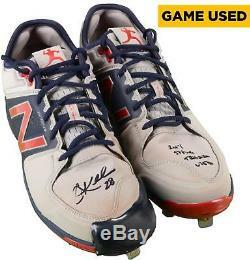 Category : MLB Autographed Game Used Cleats. These cleats were used and hand-signed by Corey Kluber with the inscription 2017 SPRING TRAINING USED. It has been obtained under the auspices of the MLB Authentication Program and can be verified by its numbered hologram at MLB It also comes with an individual numbered, tamper-evident hologram from Fanatics Authentic. It can be verified by its numbered hologram at MLB Please note that this game-used cleat may have imperfections caused by in-game play. Due to quantity levels, we do at times list a stock image of the product. This is done to standardize and expedite the listing process and only applies for merchandise that is comparably identical. Our Guarantee is simple: The excellent reputation of each supplier we do business with is the reason we stand behind every item we sell. Since we opened our hand-signed memorabilia division in 1996, we've built relationships with the most reputable memorabilia companies in the business. We will also be requiring a photo of the item you received, showing any discrepancies, as the reason for return. If your product is damaged we require that you notify us within 48 hours of receipt, all claims after this period are not eligible for return. The item "Corey Kluber Indians Autographed 2017 Game-Used Cleats with Insc Fanatics" is in sale since Thursday, July 13, 2017. This item is in the category "Sports Mem, Cards & Fan Shop\Game Used Memorabilia\Baseball-MLB\Other MLB Game Used Mem". The seller is "sportsmemorabilia" and is located in Fort Lauderdale, Florida. This item can be shipped to United States, Canada, United Kingdom, Denmark, Romania, Slovakia, Bulgaria, Czech republic, Finland, Hungary, Latvia, Lithuania, Malta, Estonia, Australia, Greece, Portugal, Cyprus, Slovenia, Japan, China, Sweden, South Korea, Indonesia, Taiwan, South africa, Thailand, Belgium, France, Hong Kong, Ireland, Netherlands, Poland, Spain, Italy, Germany, Austria, Israel, Mexico, New Zealand, Singapore, Switzerland, Norway, Saudi arabia, Ukraine, United arab emirates, Qatar, Kuwait, Bahrain, Croatia, Malaysia, Brazil, Chile, Colombia, Costa rica, Panama, Trinidad and tobago, Guatemala, Honduras, Jamaica, Barbados, Bangladesh, Bermuda, Brunei darussalam, Bolivia, Ecuador, Egypt, French guiana, Guernsey, Gibraltar, Guadeloupe, Iceland, Jersey, Jordan, Cambodia, Cayman islands, Liechtenstein, Sri lanka, Luxembourg, Monaco, Macao, Martinique, Maldives, Nicaragua, Oman, Peru, Pakistan, Paraguay, Reunion.